Now that you accept the responsibilities of becoming a dog owner as mentioned in Part 1 and have decided upon the age and gender of your pet, it is time to select the breed(s) most suitable to your lifestyle and preferences. The American Kennel Club (AKC) recognizes and registers over 170 distinct breeds of domestic dog. Other organizations, such as the United Kennel Club (UKC), States Kennel Club (SKC), or Canadian Kennel Club (CKC), may register breeds not recognized by the AKC. Mixed breeds can complicate the matter further. Consequently, there are well in excess of 170 breeds and combinations of breeds from which you can choose. Before selecting the most appropriate individual dog, you should narrow your search by breed. In general, members within a breed will exhibit many common tendencies and characteristics. Many of these behavioral tendencies are advantageous when performing the work assignments for which the dog was originally bred. The AKC categorizes the 170 plus breeds into 7 major groups: Herding, Hounds, Non-Sporting, Sporting, Terriers, Toys, and Working Dogs. The breeds classified within each group will exhibit many common preferences, traits, and abilities. Below is a synopsis of the working traits manifested by each group. Perform herding and sometimes guarding functions for livestock and other animals, such as cattle, sheep, geese, goats, ducks, and reindeer. Hunting dogs that can be further subclassified into Scent Hounds and Sight Hounds. Hounds often hunt in packs, independently from the hunter, with only an occasional bugle call (scent hounds only) as a directive command. Scent hounds follow a track or trail that leads the hunter (often on horseback) to the prey. Sight hounds generally work in small packs of three to five dogs. They visually locate prey, then with great speed chase, capture, and often kill the prey. Most were bred initially for working purposes including killing vermin, baiting bulls, dog fighting, accompanying carts, property protection, and water retrieving. However, the importance of their working purpose diminished over time. Hunting dogs that are further subclassified into Pointers, Retrievers, Setters, and Spaniels. Hunting dogs that are bred and trained to detect, dig, and/or follow prey underground or into a burrow or confined area, then either flush or kill the prey (usually rats). Some toy dogs were originally created for a working purpose, especially as rodent killers or watchdogs. However, the majority of toy dogs were bred to satisfy the demand for household lap dogs. Perform various functions including guarding of property, person, or livestock or hauling/carting. Dogs will tend to exhibit temperament and behaviors that were advantageous to their original working purposes. However, traits advantageous during work may not be advantageous at your home. Knowledge of group tendencies aids in advancing breed selection and in understanding expected behavioral traits once a puppy or dog is brought home. For instance, herding dogs are more likely to bark, chase and herd children, nip children in play, and nip your heels as you run upstairs. Sight hounds are more likely to chase and kill fast moving, small animals. Scent hounds are more likely to walk with their nose down, pay inordinate attention to a ground scent, and bay loudly. 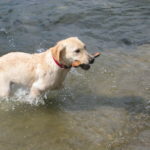 Sporting dogs are more likely to exhibit mouthy behavior, enjoy swimming, and express an interest in birds. Terriers are more likely to bark, dig, kill rodents, and in some cases fight with dogs. Toy breeds are more likely to bark excitedly from their watchdog days. Working breeds developed as flock guardians are more likely to exhibit extreme guarding behavior. Moreover, dogs bred to work independently, such as scent hounds or flock guardians, are often less trainable in obedience than dogs bred to work at the direction of a hunter or handler, such as herding or sporting dogs. All these traits can be controlled to some degree by early socialization and training. Yet, in most cases, a Beagle is more likely to stubbornly ignore your commands while instead tracking a scent than a Labrador or Border Collie. Similarly, a Border Collie is more likely than a Beagle to inexorably demand play or nip children when they run in the backyard. After considering the traits of each group, ask yourself the following questions. The questions are designed to narrow your search to five breeds or less. 1. What size of dog do you prefer- toy, small, medium, large, giant? 2. What type of coat do you prefer your dog have- short, long, curly, wiry? 3. What coat pattern do you prefer- solid, multi-color, patch, merle? 4. What coat color do you prefer- light, dark? 5. How much money are you willing to spend acquiring your dog? 6. How much money are you willing to spend on dog food per year? 7. How much money are you willing to spend on professional grooming per year? 8. How often will you make time to groom your dog? 9. Are you or is any member of your family allergic to dogs? 10. How averse are you to dog hair and shedding? 11. Do you mind if the breed is prone to drooling? 12. Why do you want a dog- child companion, running companion watchdog, lapdog, therapy dog? 13. What temperament do you prefer in a dog- one person dog, social, calm, active, playful? 14. Do you wish to avoid a breed prone to excitability, excessive barking, a greater than average need for social contact or attention, or extreme guarding tendencies? 15. What breeds are most appropriate for the size and constitution of your family? 16. Do you want to avoid a breed prone to health problems or a shorter lifespan? 17. Do you have the finances to care for a dog that develops acute or chronic health problems? 18. How energetic do you prefer your dog- sedentary, mildly active, always on the go? 19. What is your activity level? 20. How much time per day do you have available to vigorously exercise your dog? 21. What is your physical size and strength level? 22. Are you physically capable of managing the breed you are considering if he/she lunges, jumps or pulls? 23. How large is your home? 24. How large is your yard? 25. Is your yard fenced? 26. How close is the nearest park where you can exercise your dog? 27. How much time will you spend with your dog during an average day? 28. How trainable do you require your dog? 29. How lofty are your training goals? 30. Are you interested in participating with your dog in competitive events and if “yes”, which events? 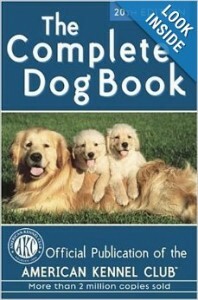 The AKC Complete Dog Book is an excellent reference for viewing photographic and text descriptions of various dog breeds. After answering the preceding questions objectively, consult suggested reading materials, such as The AKC Complete Dog Book, The Reader’s Digest Illustrated Book of Dogs, The Roger Caras Dog Book, and The Perfect Puppy (Benjamin and Lynette Hart). The books will provide photographs and illustrations of each available breed, along with text descriptions of each breed’s history and characteristics. Alternative sources for information and opinions include friends and neighbors who own or have owned breeds under consideration, veterinarians, internet websites, internet articles, and internet chat rooms. The above questions combined with the recommended reading materials and alternative sources should assist you in narrowing your search to a maximum of three to five breeds. Once reducing the number of breed candidates, observe the breeds firsthand. Attend a dog show and/or make appointments to visit breeder facilities, friends, or neighbors that own the breed(s). Then, narrow your choice to the single most suitable breed. Lastly, investigate options for purchasing or adopting a puppy or dog from a breeder, humane society, rescue organization, or prior owner. Please note that the above process is also relevant when deciding upon mixed breed dogs, as mixes will usually demonstrate the traits prevalent to their pertinent breeds. If the decision process appears overwhelming, consult with CPT. A CPT Head Trainer can assist you during all phases of the selection and evaluation process. Part 3 of this article will further assist your purchase or decision process by instructing you how to evaluate a breeder or shelter facility.